Samsung Electronics, the world leader in advanced memory technology, announced that it has begun mass producing the world’s first one-terabyte (TB) embedded Universal Flash Storage (eUFS) 2.1 for smartphones, powered by the company’s fifth-generation V-NAND. Many of the Android phones include a microSD slot that allows users to expand the internal storage capacity of their device. With the new 1TB eUFS, users will now be able to enjoy storage capacity comparable to a premium notebook PC, without having to pair their phones with additional memory cards. 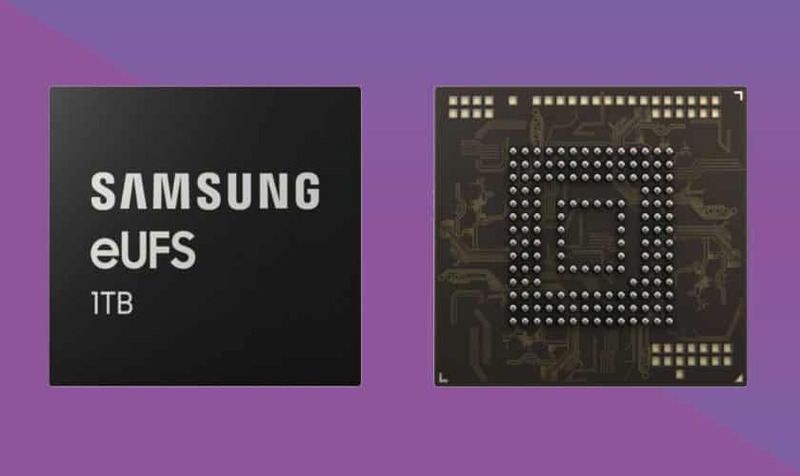 “The 1TB eUFS is expected to play a critical role in bringing a more notebook-like user experience to the next generation of mobile devices,” said Cheol Choi, EVP of Memory Sales & Marketing at Samsung Electronics. The new 1TB eUFS measures just 11.5mm x 13.0mm. Besides the huge memory capacity, the 1TB eUFS also possesses exceptional speed. Samsung claims that the chip will offer up to 1,000 megabytes per second (MB/s) in terms of sequential read speeds, which is approximately twice the sequential read speed of a typical 2.5-inch SATA solid state drive (SSD), and up to 260MB/s in sequential write speeds. This new chip allows smartphone users to store 260 10-minute videos in 4K UHD (3840×2160) format, in contrast to the 64GB eUFS chip mostly used in many current high-end smartphones that can only store 13 videos of the same size. In December 2017, Samsung had begun mass-producing its 512GB storage chips, which was later included in the company’s premium Galaxy Note9 smartphone. Presuming a similar rollout, we could likely see Samsung’s upcoming Galaxy S10 come with a 1TB storage capacity option.